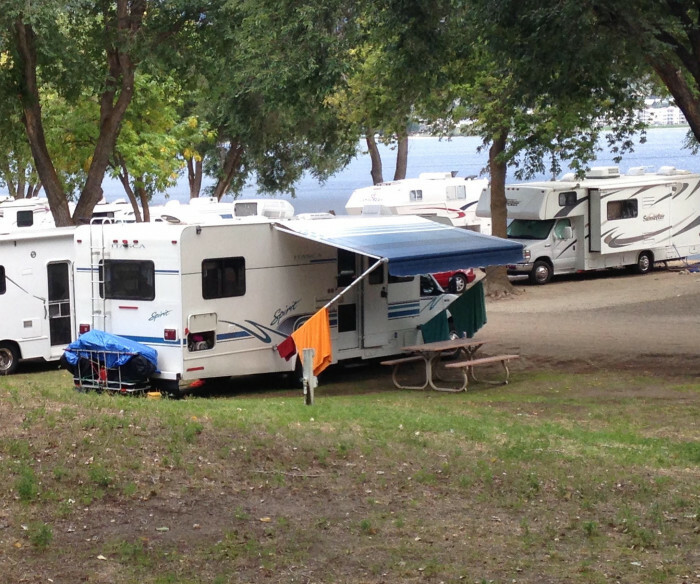 Ask fellow campers about "NK'MIP RV Park" and nearby attractions. 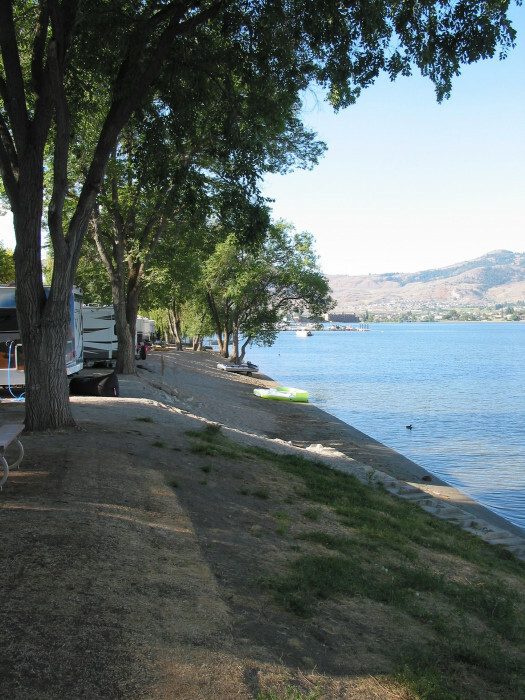 Nice campsite on Osoyoos Lake. The staff is helpful and there are a variety of sites depending on your rv size. Everything from tents to the biggest can stay here. Full hookups however the lake front sites are pretty close together. No complaints though and we will stay here again. We camped at NK'MIP RV Park in a Travel Trailer. Pros: - Beautifully situated on Osoyoos Lake - Lots of beach access - Big mature trees for shade - Clean - Friendly staff Cons: - Poorly managed - Reservation and Check-in process is awkward - Wifi strong, but drops often - Bird cannons firing intermittently during grape season Note: We arrived in the beginning of September without a reservation, and the park was very full. There was a long line-up at the Check-in desk with only one person until another person arrived about 15 minutes later. She was very nice & seemed to struggle with finding us adjacent spots for us & our friends, but did find a couple spots. The clue was when she said, "If you don't like them, just come back & I'll find you something else." When we arrived at the sites, both spots were nice but soaked with sprinklers that appeared to have been running a long time. The ground was too mushy to walk in. So back we went. OK....on to another 2 sites. Came back, & one was occupied. Back again......"oh, they must be in the wrong spot. They've been there for 3 days." The girl gave me two different sites....we went there & they were being drowned with sprinklers. Too exasperated to continue, we returned to the original spots that had dried a bit because we had moved the sprinkler away ourselves at the beginning of the ordeal. Then it was a struggle to fit into the site due to the rising slope at the back. The hook-ups are a few feet up the slope. A lady camped across from the sites said she had watched 3 rigs previously approach the site & leave. I told the desk to tell someone to turn off the damn sprinklers & they called maintenance. There apparently is a big lack of communication. I mean, why spoil the only sites you have left by watering sand......no grass there, just dark sand. The whole experience was a giant spoiler, so we'll never return. We camped at NK'MIP RV Park in a Motorhome. Wineries, local fruit stands, useable/accessible lakefront. They never said when we called that we couldn't even register until after 1:00pm, so we stood there with a number of other people. By 12:45 the RVs that wanted to register went up the hill and around a corner, out of view. The staff in the registration office were rude and didn't even make eye contact with the 10 or so people waiting until.... 1:00pm. Very very poor customer service. They have rules that are not enforced. We saw a number of children driving golf carts all around the park. Speed limits are 10km/h however, I don't even think kids on bicycles were riding that slow. Cars and trucks flying every which way, even pulling trailers. It seams that after people register they tried to make up for lost time by driving at warp 7 to their camp site... on gravel roads... kids everywhere... terrible. Tripping hazards in campsites with underground spilling systems - hose ripped 1/2 out of the ground. Landscape cloth 1/2 torn out of the ground, a tripping nightmare in a few of the sites we saw. The cement inverted rig that held the sewer drain cap was at such a steep angle that my elbow and hose wouldn't connect securely. So I piled a bunch of rocks on top to keep the hose and elbow from pulling out of the hole when I drained my tanks. Ours wasn't the only sewer drain like that either, we could see other people doing the same thing when they dumped. We even loaned our rocks to a neighbor so they could dump. The trail / path to the beach is a super hiway with golf carts, including the campgrounds, speeding by kicking up dust which flowed right over to our site. Then there are the rocks the campground had placed so that full size vehicles couldn't get through... well every dog that went of a walk, did #1 on those rocks. It was 37c when we were there, and guess what happens to that dog pee...? It may be some people's cup of tea, those big resorts where people are parked on top of each other however we will spend our money elsewhere next time in that area. We camped at NK'MIP RV Park in a Truck Camper. Traveled here for the first time with 4 other rigs. There was 10 of us on total. We had decent sites in section C on the hill with a lake view. When we arrived we were very happy to have some big trees in front of us that would provide some shade but within a couple days we were invaded by these horrible Beetles that invaded all of our trailers. We finally found out that the trees in front of us were Elm trees and these nasty Beetles were called Elm seed Beetles. They were on and in everything and apparently they live on the seeds that fall on the ground. I fought these bugs off for 2 weeks and am still fighting them off in our trailer. They are nasty and need to be dealt with. If you stay at this park make sure you are not any where near these trees. This park is nice with many young families. The roads are good throughout with several green spaces but most sites are in dirt. There were quite a few children driving golf carts around faster than they should so let's hope their parents have good insurance. Do not arrive before 1pm or you will be sitting at the office in the heat. They will not check you in until then. Did not use the cable because we had Satellite and the WiFi never worked for us We camped at NK'MIP RV Park in a Fifth Wheel. For a change we went here without a reservation. Hard to believe that C section which has full hookups and cable TV was already full up with snowbirds. It seems they keep coming earlier and earlier each succeeding year. So we went with plan B which is the F section. The road to it had vehicles parked out in the way, so had to watch where we were going. This is a small area one row up from the waterfront sites. It worked out fine for us and our son who had a site next to us. Most of F section are short sites with the longest no more than 40 ft. However, the waterfront sites down below us were even shorter. Some could barely fit a truck camper or a tent. I wouldn't rate these sites better than a 6. Our site was a back-in, fairly level, and gravel. Between the sites in our section there was a bit of grass, but pretty thin with more sand and dirt than grass. Hookups were well placed for us. Water in the rear, sewer in the middle, and power in front. However, adjacent sites didn't have the hookups in the same locations as ours. Go figure. The utilities all worked fine. It was 30 amp power, but didn't need to use the A/C. No breaker on the power box that was accessible. The free Wi-Fi worked well enough at times for browsing and email. Sometimes even for video. No OTA TV, but satellite worked fine. The campground has a store, but it was already closed for the season. There was a restaurant near the dock, but we didn't try it. Lots of trails to walk on. We camp here quite frequently and first time we saw some of the Indian Reserve horses have the run of the place. Of course we had to watch our step after that. It was a weekend and more noise of course, but not that big a deal. We will continue to stay here when in the area. We camped at NK'MIP RV Park in a Motorhome. This was my first time staying at NK'MIP Campground and RV Resort even though I live only a couple of hours north. Let me start with check in. I arrived at the campground at about 11:30 am. Our arrival time was unavoidable as I were travelling from further south. I hoped to set up the coach, head home with the car to pick up my wife and then return later in the day. Unfortunately I was not permitted to check in before 1:00 pm. We ended up leaving the coach on the side of the road until we returned from home about 6 hours later. The person working the front counter couldn't have cared less. Customer service seemed foreign to her and she was borderline rude. I explained that we were joining two other RVs and would like spots together if possible, but again she couldn't have cared less. This park has the possibility of being a 1st class resort, but that would require maintenance. What used to be grass in now a weed patch. The washrooms were not cleaned often enough through the day and in general the place is getting run down even though it is not that old. On the plus side, the roads are paved and in good condition, the sites in "C loop" are large with trees between site. The hookups are good and positioned well. We camped at NK'MIP RV Park in a Motorhome. First of all don't arrive before 1pm,because they will make you wait until exactly check in time. We thought this was because they were getting the site ready for our arrival,wrong. The garbage left by the previous campers was not cleaned up,in fact it was not until the next day that it was picked up. Maintenance drove by numerous times without stopping. The site we were put in was partially our fault because we didn't read the reviews on this site. We originally had a full hookup site in the newer area but because we have never been here before we opted for a site near the beach. We still had full hookups minus cable with no discount in the rate. We weren't here to watch tv anyways. In a way it wasn't all that bad because there is a lot of shade so the air conditioner wasn't running all day long like it would have been in the upper levels where there is no shade trees. The 10 kph speed limit rule is not enforced,golf carts can be seen driven at top speed throughout the campground. The lakefront sites are rather small but are also the most desirable spots. The beach is almost nonexistent except for a few small areas of sand to access the water and launch your floaty which we and many others choose to do. It is a private resort so taking beverages to the beach was also most enjoyable. When we are back in the area we would stay here again. We camped at NK'MIP RV Park in a Fifth Wheel. Nice camp ground with easy access to the many wineries in the area. We camped at NK'MIP RV Park in a Fifth Wheel. If you are using a mid to large size RV DO NOT ask to be near the water, they are packed in like sardines and access is a very dusty road. Stay in the "C" series sites which are spacious. Access to the lake is not easy and there is no beach to speak of. We stayed 2 weeks plus one day extra. We have stayed here before, once on the lakefront, once in the newer section away from the lake. This time we picked a lakeside site for the view and lake access. These older sites are only 30 amp, but that was sufficient. Park check in was quick and pleasant. Unfortunately, the indoor pool is closed in the summer, and there was only the lake for swimming. The view from the lake is beautiful in all directions, with mountains, vineyards, and the town of Osoyoos. Site on the lake are smallish, but not cramped. Sites in the newer section are larger. The whole park is quiet. The nearby cultural centre was nice. Tried fishing from bank, but too shallow near shore. We would stay here again. We camped at NK'MIP RV Park in a Motorhome. We do not pull a toad but found a car rental (EZ truck and car Rental) in nearby Oliver, BC that delivered the car in "Enterprise" fashion. We toured and tasted our way around many wineries in the area, leaving even more for future visits. 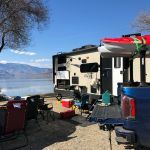 Despite the changes to beaches and lakefront paths due to spring floods in the Okanagan, our month-long stay at this campground/resort near Osoyoos has worked out well. We stayed in a pull-through site in the newer part of the campground, near a clubhouse, laundry and washroom building. The site was long, wide and cleverly landscaped to screen out the nearby garbage and recycling bins. In future, we will choose a more scenic site, perhaps with a view of the vineyard, even if it isn't a pull-through. Our decision to avoid lakeside sites was wise, for us. As others have noted, the lake-side sites are more compact and often noisier, having attracted the party-types. At time of writing (mid-June), the lake is murky with run-off, power boats are forbidden and the beaches are just starting to return. That said, there is much to do in the area, especially if one enjoys visiting wineries, cycling or walking along one of the many segments of the Kettle Valley Railway (KVR) trail. Staff at the Osoyoos Visitor Centre are friendly and helpful, as are those in nearby Oliver. We camped at NK'MIP RV Park in a Fifth Wheel. 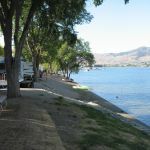 Good shopping for groceries in nearby Osoyoos as well as pleasant walks along the lake near Gyro Park. The Owl offers reasonably priced lunches with a great view of the lake. Quick, efficient check-in. Site was a gravel back-in and fairly level. Power and water were in the rear corner while sewer was further forward and aligned perfectly for my sewer outlet. Didn't have power at first and found that the breakers were hiding underneath the post cap, so you have to get down and see which side the 30 and 50 amp ones are on. Our site had cable TV and it worked fine. Free and open Wi-Fi which kept bumping me off, so I wasn't impressed. Walking trails around the park and close to the other Resort attractions such as the Desert Cultural Centre and the Cellar Winery. Park had quite a few snowbirds still and with the Easter crowd was pretty full. Even so, it didn't seem all that noisy. We have been coming back here for years and will continue to do so. We camped at NK'MIP RV Park in a Motorhome. Nearest convenience store is the NkMip Resort gas station about a mile away. Nearest supermarket is AG Foods, over 2 miles away in Osoyoos. Bit of a lineup for check-in as it was quite busy when we arrived. Once we got to the counter it was quick and efficient and staff were friendly. We got a site in the C section which have full hookups and cable TV. Most sites are back-in, but there are pull-throughs available. Ours was a gravel back-in, level, fairly private with a hedge on either side. Water supplied by hydrant. Excellent sewer outlet close to the middle of our rig. Dangling phone connection box from the pedestal that didn't appear to be used anymore. 30 amp cover missing. Other than that, all utilities worked fine. Cable TV had around 50 channels and they were clear. Didn't bother with the Wi-Fi, so no comment there. There are about 5 or 6 sites for dumpsters and recycle bins for bottles and cans, so not too far a walk. Noticed the yurts are no longer there and that area is now occupied by tents. Small beach and play area, but not much for entertaining the kids. The horse rides looked like they were already finished for the season. The store is only open for July and August, so it was closed at the time of our stay. Propane available, but more expensive than at local gas stations. A few walking trails that lead to the rest of the resort or towards town. We have been staying here many times in the past and will continue to do so. We camped at NK'MIP RV Park in a Motorhome. I have similarly reviewed this park in the past, the office staff is even worse now than it was 4 years ago. They really don't care about customer complaints, sites are often double booked. Long term stay(1 month) is supposed to get preference over shorter stays. I book 1 year in advance and still I am expected to stay in one site until the people in my preferred site have moved on after staying for 2 or 3 nights. Why aren't these short stays put into the site that I had to occupy for the same 2 or 3 nights so I can go straight into the site I booked for 1 month. The pool is supposed to be open from the beginning of Sep. till the end of June. We were given 3 different excuses as to why it was not open when we arrived on Sep.9. At least if they are going to lie, they should get together and tell the same lie. Apparently they used the same stories back in June when friends were here. They are the only game in town so they can get away with whatever they want. I hate to admit it but I will likely be back next year unless I can find somewhere else close. If the facilities were managed and maintained better, this could be a very nice park. We camped at NK'MIP RV Park in a Fifth Wheel. We stayed here on the last weekend before school started - busy place but great. There are waterfront sites that are packed in an busier and upper sites that are much more spacious and quieter. 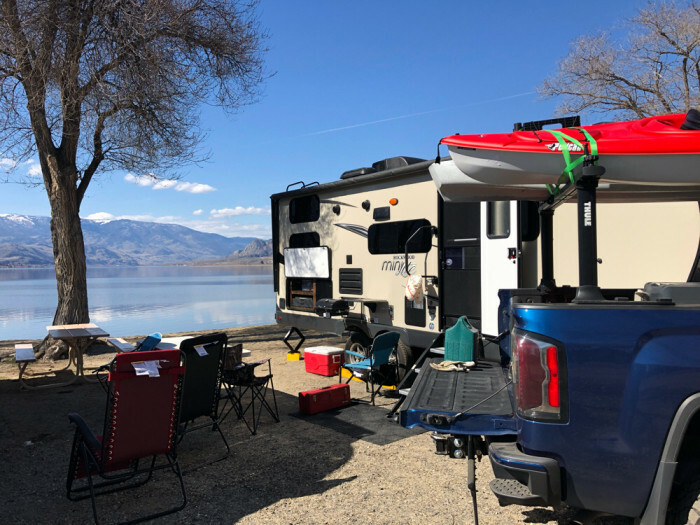 We chose a waterfront site hear the off leash dog beach (we have a Lab) where our rear-living travel trailer's bumper was 3 feet from warm, swimmable Lake Osoyoos and 2 feet above the water. Great views. We parked across the front of our trailer. Yes the lake sites are tight and yes folks might have to move tow vehicles to get in and out sometimes but everyone was very accommodating. The view is well worth it. 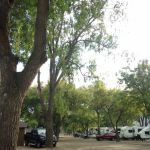 We camped at NK'MIP RV Park in a Travel Trailer. There is a great desert walking trail from the RV park up to the Nk'Mip Resort/Spa/Winery that takes you through an operating vineyard. Drive up the highway towards Oliver and visit the numerous wineries along the way. Great fruit stands too. Lots of "summer" things to do in Osoyoos. If you are into trains, don't miss the Desert Model Railroad just a short distance out of town on the highway to Vancouver. Well worth the $8! This is a campground to avoid in the high season. Sage Pub - great food and nicest servers. Service can be slow at busy times but you're on vacation. Campo Marina restaurant was talked about quite a bit but didn't have a chance to try it out. 9 hole golf course is a challenging tight track but fun if you can hit it straight. The Marshall is super friendly. 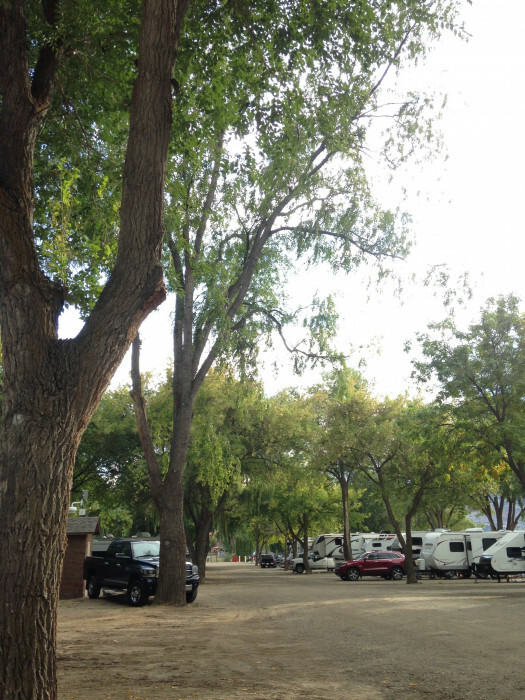 This RV park is part of a complex which includes a cultural museum, winery, and golf course. Nearest gas and convenience store back near the highway just under a mile away. For supermarket and liquor store it's just over 2 miles away in town. The model train museum on the far side of Osoyoos is an absolute must! It is an outstanding implementation of a highly complex model railroad, decades in the making, and complete with 20,000 "people" less than an inch tall, all hand-painted. You will not be disappointed. Check location of sewer as this one was too far from power and water and required extension hose. There is an excellent pub in Osoyoos, the Owl. Many wineries in the Canadian Okanogan, our favorite being Misconduct which also has an excellent restaurant. Be sure to visit the Desert Cultural Centre and take the winery tour, both at the resort up the hill. Campers get a discount at the cultural centre. 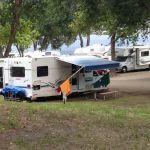 This campground is part of a resort complex that includes a winery, golf course, museum, and several other activities such as helicopter and horse rides held during peak season. Are you affiliated with NK'MIP RV Park ?